Slender and majestic, the Castle of Serralunga d'Alba overshadows one of the most beautiful and historically intact villages of the Langhe, surrounded by the rolling hills of Barolo vineyards. 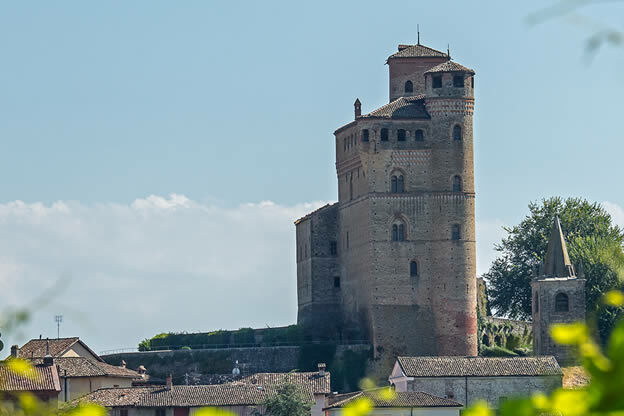 Considered to be one of the best-conserved examples of 14th century noble castles in Piedmont, this castle represents a unique piece of history in Italy with an architectural structure of a French donjon. The castle's construction was carried out between 1340 – the year in which the Falletti family received its estate as recompense for military involvement – and continued until 1357. This information is gleaned from documents that register a sale carried out in one of the castle rooms. The fact that it was never the object of military importance nor was it structurally transformed over the centuries has kept this castle unaltered. Its Medieval fortress is, in fact, the original structure. At the end of the 1300s, the castle was complete with its palacium, the long and compact principle building, and large rooms superimposed upon one another for delegation duties and living space. Its large cylindrical tower was also already constructed, as was the rooftop that affords an incredible view today, but was primarily a status symbol at the time. The courtyard at its quadrangular base is characterized by a drawbridge. The ample area of the palacium at the courtyard level was the seat of public affairs where the lord of the castle administrated justice. The room is characterized with its wooden roof and the small votive chapel with frescoes from the 15th century. The upper room was for living and has three fireplaces and even a latrine carved into a special space in the wall, a relative comfort for that period. On the third floor is a hidden parapet, initially open and protected by merlons, today covered with a roof. In 2015 the castle was given to the Polo Museale of Piemonte. The management is currently entrusted to the Barolo & Castles Foundation awarded the tender issued by the Polo Museale of Piemonte.